I’ve had a very productive week of break. I’ve been working steadily on the UI functionality and Drippy is making good progress and will make me millions. 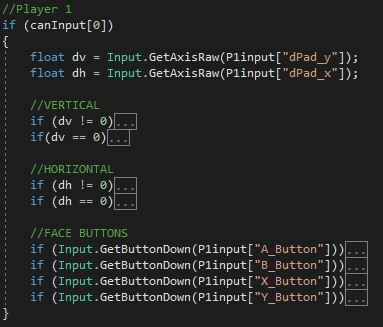 The hardest thing I was anticipating for over break was writing my own input manager to handle input from 4 controllers in the UI elements. Unity’s default method of input handling with UI elements (buttons/toggles) is an event handler that works great, but can only set up the inputs of one controller at any given time. It’s impossible to have multiple Unity event handlers in the same scene, so I realized I would only be able to use unity’s UI stuff for visuals. All of the functionality would have to be custom coded. I was worried about doing this, but on the first two days of break I sat down and busted it out. Weird. Now all 4 controllers have their inputs recognized separately of each other in a much more robust way. Players can now also navigate the label input alphabet and input their own custom labels using the controllers. This was the main thing I was worried about. But holy cow does it work well. I’m super proud of myself and look forward to wrapping up the functionality. I’ve already figured out how to render 3D objects in the menu scene (a problem we were having before), so now I just need to finish up the team/gender selection, get a placeholder in for the controls menu, and then bust out the in-game UI. All is going well and should be done by Christmas.